An International Mobile station Equipment Identity (IMEI) number is a series of numbers used to identify a device that utilises terrestrials cellular networks i.e. your mobile data network provider---each device should have its own unique IMEI number. You can even go as far as saying that it is your device's calling card. As the use of mobile devices increases, the statistics of stolen and lost devices have been increasing as well. Users are able to block stolen or lost devices for further usage if they know their IMEI number. All users need to do is call their network carrier and report that the device is stolen or lost. The carrier can block the specific device from running on their network and notify other carriers. The 15-digit IMEI number indicates the origin and model of the device. The first eight digits indicate the device's origin and its model while the last six digits identify the manufacturer of the device. If you subscribe to a mobile tracking service, you can use the IMEI number to track the device---even it uses a different SIM card. Since its primary use is to identify a mobile device no matter where they are, many people are a bit paranoid about secret societies watching over them. Many people believe that if you change IMEI Android numbers, you will not have anyone spying on you. Have you ever yearn for that cheap BlackBerry plan your network carrier keeps on promoting? The 15-digit IMEI indicates the origin and model of your device. Therefore, by changing your Android's IMEI number to that of a BlackBerry's, you will be able to subscribe to a cheaper mobile plan. In some countries, it is illegal---so do check if it is legal in yours. As far as we know, it is legal in Africa and Asia, and illegal in Europe. Change IMEI Android numbers without rooting can be a bit daunting if you have no idea how to do it yourself because it is a very complex procedure. You can tell by the disadvantages of changing your IMEI numbers in the section above. Open your Android device's Settings module. Find Backup & Reset and tap on it. 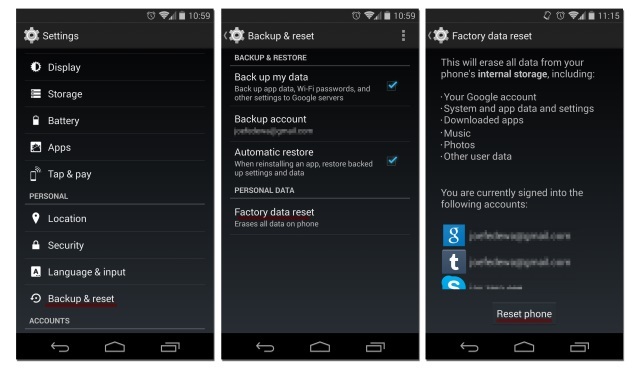 On the next menu, find Factory Data Reset and tap on it. You will then get a notification. Click on Create new (random) Android ID. 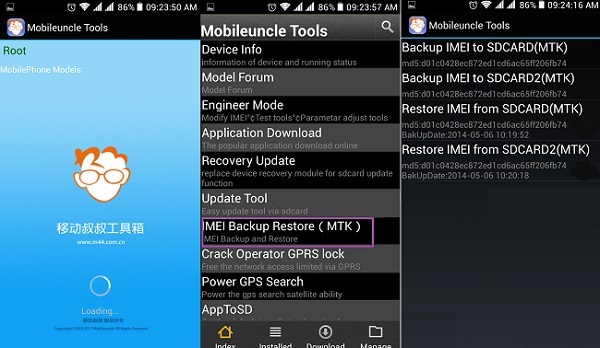 For a non-data-erasing procedure without rooting your Android device, you will need an Android IMEI changer. We have listed the Top 3 Android IMEI change apps below based on the level of complexity and effectiveness. XPOSED IMEI Changer Pro - Click here to download. 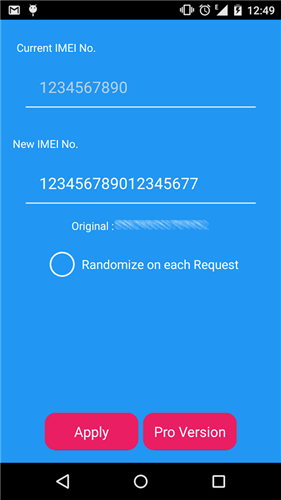 This IMEI changer Android app is built to allow a user to change the series of numbers that make up their devices' IMEI identification. Randomised IMEI numbers will be generated every time the app is used. However, users can type in a new IMEI number in the text field if they have a specific number in mind. This no-ads app is really simple to use---to complete the change, a user will only need to click the "Apply" button and restart their devices. Its interface is also simple enough for easy navigation. Mobile Uncle Tools App--Click here to download. 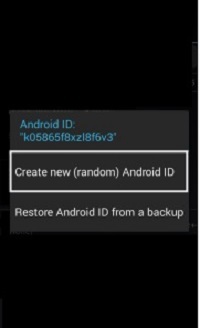 The app is a simple Android application that is able to retrieve your Android device's information, backup IMEI, change its IMEI and search for your device's recovery files. It will also be able to assist you with any rebooting needs and many more! MTK Engineering Mode--Click here to download. It is like having multiple apps once you have this installed on you Android. It was specifically made for Taiwanese device manufacturers such as Tecno, Infinix, Elephone, Oppo, Chuwi etc. While not fully recommended, there have been reports that it works with Android devices made by non-Taiwanese manufacturers. It's clean interface makes navigating the app seamlessly. You will also need the IMEI number if you want to SIM unlock your phone and use it on another carrier provider. There are a lot of SIM Unlock services out there. It is important to choose a trust-worthy and workable service to unlock your phone. SIM Unlock Service is definitely one of the best. It can help you unlock the phone permanently and you can use the phone on any carrier providers in the world. Step 1. Go to SIM Unlock Service official website, and click on Select Your Phone button. Then select your phone brand among all the smartphone brands. Step 2. On the following page, fill in your phone information, including IMEI number, phone model and your contact information, etc. Once your order is processed, the system will send you the unlock code and instruction to unlock your phone. The unlocking process does not require any technical skills and everything can manage it. By using the Android IMEI changer, you will neither lose your data nor need to root your device in your pursuit of changing your device's IMEI number. However, do remember that every situation is different and there will come a time that you need to root your device before changing your Android's IMEI number.